In some cases the problems with problems are that we isolate the process from the rest of the world. This is a process that should not be a secret and should be working with all aspects of service delivery. So it should come as no surprise that a key to the success of problem management is a strong link with incident management. This needs to be managed at a root level which relies largely on communication and collaboration within all service management processes. In my opinion one of the challenges is that as incidents are pouring in, we assume (dangerous word) that problem picks them up and works on them. The trouble is that without some solid communications and collaborative work between incident and problem we will not effectively be able to manage the problems we work on. Depending on how problem management prioritizes the influx of work, without some solid understanding of things like business impact, we may be working on the ‘wrong things’ from the start. Start by ensuring that all stakeholders impacted by the problem management process are communicating with one another right from the beginning. This should include (but not limit) a representative from the service desk, change managers and incident managers. 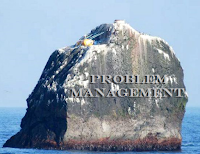 Whether we have people whose role is a problem manager, or it is a role carried out by others, allowing for a touch point to review as a group will allow the problem review to ensure that we are looking at the right incidents in the first place. When we start to get people with varying perspective on how incidents are impacting the business together we get a better ‘big picture’ sense of what is important to the business. The best way to validate this is to actually ask the business. This is where your business relationship manager might play a role in your review of the incidents. While in some cases we in IT might see that the more incidents we have the more there is impact but having a representative from the business will provide that validation that we are looking at the right things. In some cases the biggest issues are the ones that are no longer getting escalated because the business has lost hope that we will even look at it, never mind fixing it. Have these reviews regularly and review what has happened since the last meeting and ground you have covered or need to unblock. This will strengthen not only the ability to create, prioritize and work on problems but also to build out abilities in its related processes like knowledge and change management.